The KJV was taken as a tile by Flannery O’Connor in her book, “The Violent Bear It Way.” It is an allegory of the battle between good and evil, or God and the Devil. Like one of those cartoons in which an angel sits on one shoulder and the devil on the other, arguing back and forth in some poor slob’s ear, O’Connor’s teenage protagonist struggles within the same dilemma. O’Connor draws upon her devout Christian heritage in the rural South when she depicts the dichotomy between angelic and satanic in such stark contrasts. 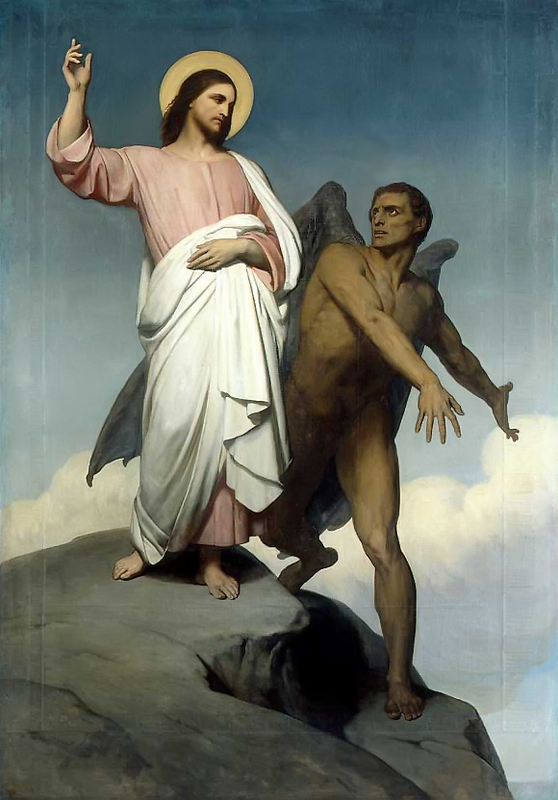 The angel-voice is that of a wildly religious great-uncle while the devil-voice is none other than an academic (a social studies teacher) who understands the world in terms of context and psychology more than scripture and moralism. It is the way we like to imagine things: categorical absolutes dividing our lives into clear choices. Certainly the U.S. Congress is a ripe example of where that kind of thinking leads us. The whole dichotomy between religious and secular, good and evil, even Blue State and Red State, is made up to sell news. It is a dangerous lens through which to view the world or ourselves. For example, in 2012 in the supposedly brilliantly red state of Arizona, the difference between Obama and Romney was only 211,000 votes out of just over two million. That means red meat Arizona has almost a million blue voters in it. In my home state of Indiana, so recently lampooned for its stupid governor and legislator pathetically pandering to the rightwing, the difference between Obama and Romney was only 272,000 votes out of two and half million. What about all those Obama voters who live and work and play in the supposedly rightwing Hoosier State? Likewise this dichotomy from preachers on both sides of the left and right – Christian, Islamic, Jewish, Humanist – painting all religious people one way and all secular people another way, is simply a false dichotomy and is dangerous. It is toxic. It is worth noting that it is not primarily religious people who set up this false dichotomy either, it is the Carl Rove’s of the world – those strategists of the “cultural wedge” that benefit and profit from our being intensely divided. This nurtured divisiveness is reinforced by the news media that also profits from it, and who, let us not forget, also brought us an uncritical and hyped-up War in Iraq because it was selling news like ice cream on a hot day. So any time we are shown a picture of reality colored in the hues of a strict dichotomy it is a cartoon rather than a clear view. Any caricature with simplistic boundaries that do not actually exist except in the mind of those who want us to see the world in that way, is untrustworthy and hazardous to our health – spiritual and otherwise. Mistrust such stark and simplistic dichotomies, and be on guard. The presence of such caricatures means we are in the presence of those who wish to bear something from us, violently if need be. Pundits and strategists would have us believe our culture wars are fueled by religion, and it would be easy to dull our pain by accepting such a false dichotomy, then curl up in our little enclave and snarl at our enemies. It would be easier but it would be foolish. It would be wiser to explore our conflicts with those who are red or blue, religious or secular, and discover common bonds and understand divergent views. Likewise, it is wiser to explore the dichotomies within us and wonder about whether our dark angels are all bad and the light angels are all good. The answer is, probably not.